The information in your credit report impacts everything from where you live to what you drive and even where you work. Unfortunately, too many people misunderstand their credit reports and the information it contains. Here are some of the most common myths about credit reports and the truth behind each. 1. You don't need to check your credit report unless you're applying for credit. Checking your credit report before you apply for a major loan can improve your chances of getting approved. Reviewing your credit report before you make an application gives you the opportunity to clean up errors and other negative information that could get you denied. You shouldn't wait until you're preparing for a major application to check your credit report. It's also important to check your credit report at least once a year to search for signs of identity theft or fraud. Proactively reviewing your credit report will allow you to catch and deal with identity theft before it gets worse. If you're looking for a job or if you're up for a promotion you should check your credit report. Many employers view credit reports (not credit scores) and you want to be prepared for what they may find. This is especially important if you're applying for a financial position or a high level executive position. You have the right to a free credit report if you're currently unemployed and plan to look for a job in the next 60 days. And, anytime you're denied for a credit card, loan, or another service because of information in your credit report, you should check the copy of your credit report used in that decision to confirm the information is correct. You'll have the right to a free credit report in this instance. If credit report errors led to your being denied, you can dispute those errors with the credit bureau and ask the creditor to reconsider your application. 2. Checking your credit report will hurt your credit. You've probably heard that inquiries into your credit report can negatively impact your credit, but that doesn't include your own inquiries into your credit. There are two types of credit inquiries. Hard inquiries are made when you make an application for credit or a credit-based product or service. These inquiries do hurt your credit score. Soft inquiries are made when you check your credit or a business check, your credit to prescreen you for credit products or services. These soft inquiries do not hurt your credit score. Going through a lender to have your credit checked will hurt your credit. To avoid having your credit affected, you should check your credit report yourself by going directly to one of the three major credit bureaus. There may be a fee when you order your credit report from the credit bureaus unless you qualify for a free credit report under the Fair Credit Reporting Act. You can order one free credit report each year through AnnualCreditReport.com, the site for ordering the free credit report granted by federal law. It's good news that your own credit checks won't hurt your credit. That means you can check your credit as often as you need to without fear that it will hurt you. 3. Paying off a past due account will remove it from your credit report. Paying off a delinquent balance is better for your credit in the long run. Unfortunately, this payment won't erase the account or the payment history details from your credit report. All the past negative payments will remain on your credit report for the duration of the credit reporting time limit, but your account will be updated to show that you've caught up the past due balance. If your account is still open and active, your future timely payments will be reported as ok. Accurately reported negative information can remain on your credit report for up to seven years. After that time period, the negative details should be deleted from your credit report automatically. 4. Paying on a debt will extend the credit reporting time limit. Some people hesitate to pay off an old account because they believe that payment will restart the credit reporting time clock, keeping the account on their credit report for another seven years. Fortunately, this isn't the case. The credit reporting time limit is based on the time that's passed since the negative action. Making payments on an account won't restart that time period. For example, if you were 30-days late on a credit card in December 2010, caught up again in January 2011 and paid on time ever since, the late payments will fall off your credit report in December 2017. The rest of the account history from that point forward will remain on your credit report. 5. Closing an account will remove it from your credit report. Another common misconception is that simply closing an account will delete it from your credit report. However, that's not the case. When you close an account, the only thing that happens as it relates to your credit report is that the account status is reported as closed. The account will remain on your credit report for the remainder of the credit reporting time limit if it was closed in bad standing, for example, if the account was charged off. Or, if the account was in good standing when it was closed, it will stay on your credit report based on the credit bureaus guidelines for reporting positive, closed accounts. 6. Getting married will merge your credit report with your spouse's. When you get married, you'll continue to maintain a separate credit report from your spouse, even if you change your last name. Some joint accounts, authorized user accounts, and co-signed accounts may appear on both spouses credit reports, but individual accounts will continue to be listed on each respective person's credit report. 7. Only credit cards and loans show up on your credit report. When you read through your credit report, you might be surprised at all the types of accounts that show up. Medical bills, debt collections, and public records like bankruptcy or tax liens are listed on your credit report in addition to credit cards and loans. Because they aren't credit accounts, bills like cell phone payments or utility payments are not regularly reported to the credit bureaus. If these accounts become severely delinquent, they may be added to your credit report as a collection account. 8. Employment history and income is included in your credit report. 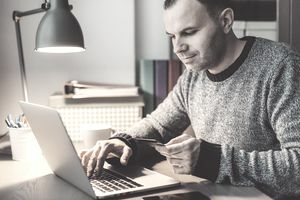 In a 2015 TransUnion study, 55 percent of people who'd recently checked their credit report believed a full employment history appeared on their reports. And 41 percent thought that income is listed on their credit reports. Your current employer may be listed on your credit report, but that's it. Your credit report won't keep a list of your previous employers and it doesn't list your income. Credit and loan applications, however, will ask for employment and income information to approve your application. 9. Rental history is listed on your credit report. In TransUnion study, 49 percent of people with excellent credit believed that rental payments are included in credit reports. Rental accounts generally don't appear on your credit report, but there may be some exceptions. Rent payments made to apartments that report to Experian RentBureau will be included in your Experian credit report. Credit bureaus generally do not share information, so these rent payments won't appear on your other credit reports. 10. Accounts you've only cosigned don't appear on your credit report. When you cosign a credit card or loan, it appears on your credit report just like the other information just like all your other accounts. The account's usage and payment activity will appear on your credit report and affect your credit, even if you're not the one who uses or benefits from the account. Unless your name was cosigned without your permission, you won't be able to remove the cosigned account from your credit report.